It was a Monday night following one of the craziest weeks of DC sports. A perfect night to stay in and recover from Samples, Shots, The Winter Classic, and KD 2 DC...But then of course somebody suggested that the Wizards really needed our help to beat the Pelicans. I guess it was time to head back out to the bar...for the team and all. I sat down at the bar thinking about ordering a nice delicious water but as soon as I sat down in my seat the bartender placed a beer in front of me. But this was not an ordinary beer. It was a MONSTER! 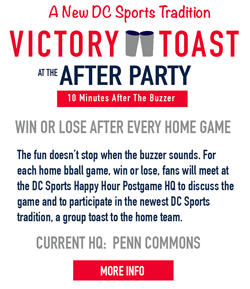 First Down is a divey sports bar located across from the Ballston Metro stop in Arlington, VA. This is one of my favorite spots as they have some pretty good bar food and cheap beer for cheap prices. 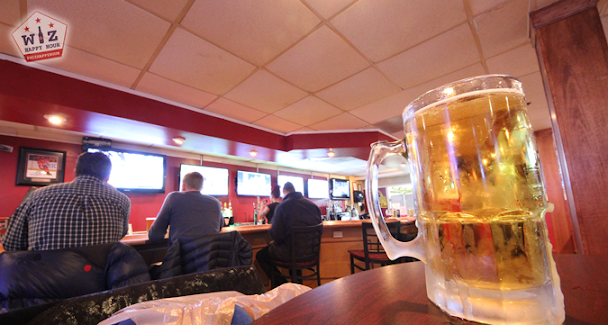 Monday nights is a great night with 32oz monster mugs of Bud Light for $6, 60 cent wings, 1/2 price burgers, and a happy hour that runs all the way until 8pm. 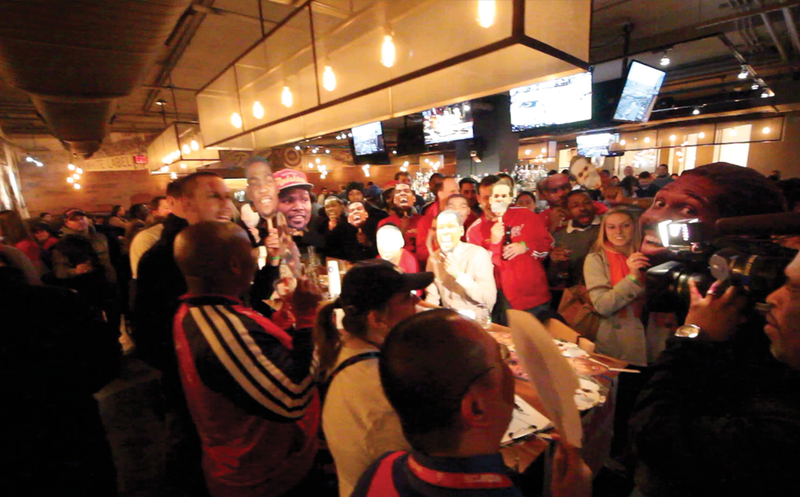 The atmosphere in the bar was dead, but after a whole lot of big mugs and a Wizards lead the Wiz Happy Hour crew was into the game. It was actually quite funny because with a lead the whole game everyone watching was groaning and holding their breath, expecting something to go horribly wrong. However, like most of this year's Wizards, this no longer happens. The Wizards won! 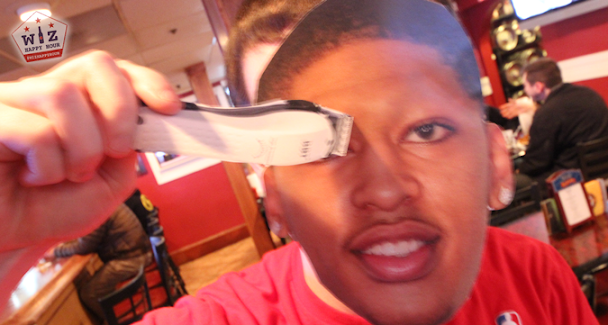 Last time the Wizards played the Pelicans we did a bit where we fake shaved Anthony Davis' unibrow using some cardboard cutouts. We had some left over so we kept up the schtick. 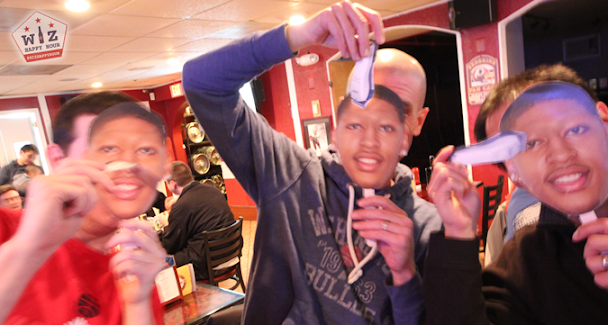 Sure we looked weird in the bar, but it was worth it. Oh and a note. Don't let bartenders take photos! It was another fun time considering the last minute nature of the meetup. 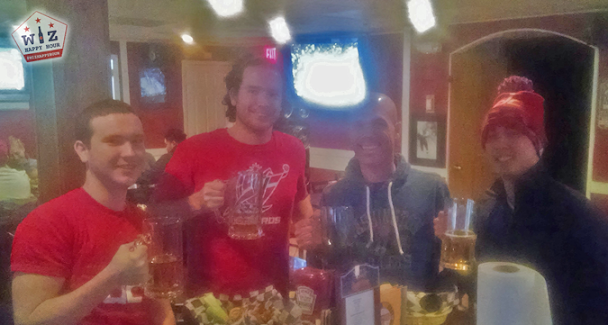 We had some great wings, some cheap beer, and saw our team win a game. Hope you can join us next time and make it even more fun!